by train with the Nord Barese Railway Line (ferrovienordbarese.it), reaching the station of Bari Centrale. Leaving the station, you get Piazza Aldo Moro: at that point, turn left to reach FAL (Ferrovie Appulo Lucane), where several trains arrive at Matera Centrale Station in about 80 minutes. You can get to Matera from Brindisi airport (about 154 km) with Pugliairbus via Bari Palese airport (and vice versa). Naples Capodichino Airport is about 300 km from Matera. Once landed, you can take a bus line (see section “By Bus” for more information). If you arrive in Bari with the state railways (Trenitalia), exit from Bari Centrale Station, and you arrive at Piazza Aldo Moro. At that point, turn left to reach FAL, where several trains arrive in Matera Centrale Station in about 80 minutes. WARNING: On public holidays there are no trains but only a few buses. 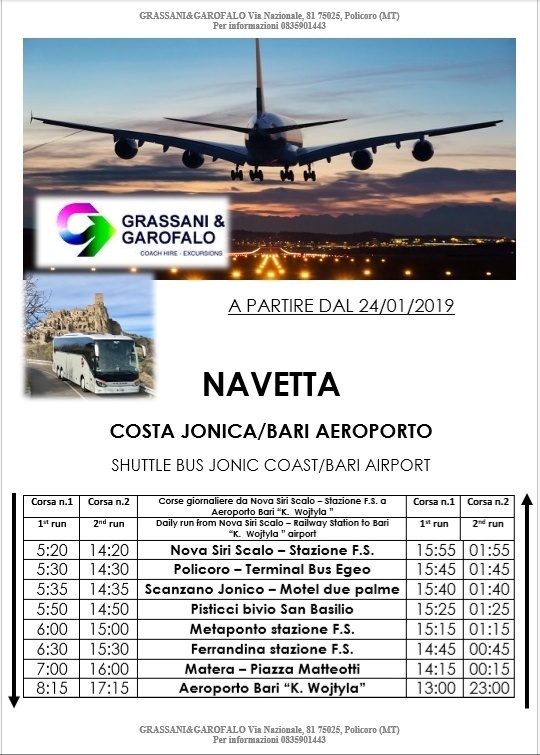 Those arriving by train to the Metaponto railway station (about 50 km from Matera) can take the Sita buses (remember: select Basilicata), informing them beforehand about the timetable because the races that connect Metaponto to Matera are not many. book a private transfer by sending an e-mail to info@ferulaviaggi.it. For those who decide to arrive in Matera with Italo Train’s rail services, the Italobus shuttle service is available, which connects the railway station of Salerno to Matera’s main station with 4 daily races. It is not possible, however, to buy a ticket just for the bus, but you need to buy a train ticket and request the shuttle service. – from Rome, Florence, Pisa and Siena you get to Matera with the Marozzi and Liscio buses. – Marino coaches connect Matera to Milan, Ancona, Bologna and Naples. – the Petruzzi bus lines connect Matera to Bologna, Modena, Parma, Chieti, Pescara and Rimini. – the Miccolis buses connect daily with 3 fast runs Lecce, Brindisi, Taranto, Matera, Potenza, Salerno and Naples. During the month of August there is a stop at departure and arrival at Gallipoli. Additionally, Flixbus connects Matera to several destinations. Take the highway A14 Bologna-Taranto up to Bari Nord exit. Continue for Altamura-Matera street and exit to Matera 2 until you reach the center. Follow the signs for Via Aldo Moro parking. Reach Brindisi and then follow the signs for Taranto. Once in Taranto, follow the signs for SS 106 Jonica (direction Reggio Calabria) until the exit Matera, near Metaponto. Take the highway A3 Salerno – Reggio Calabria. Take the exit for Potenza and continue towards Metaponto along the SS 407 “Basentana”. After Ferrandina Scalo, take the exit for Matera and take SS 7 “Appia” and exit at Matera 2. Take the highway A3 Reggio Calabria-Salerno. After Cosenza, take the exit for Sibari and then SS 106 Jonica towards Taranto. Take the exit Matera, immediately after Metaponto and exit at Matera 2 until you reach the center. A good alternative, especially for those who must get to Matera from Bari Palese Airport and the Central Railway Station of Bari (or vice versa), is our transfer service. It’s h24 available.